Title: Best Party Book Ever! Parties are a big thing in my family. I've loved them growing up and now my littles looks forward to them every year for her birthday. Party planing for me is a several month adventure. Choosing the theme, and from there the decorations, food, guest lists, and many other little things. However, in the chaos of my brain things generally slip from thought. Then I feel panicked....very bad for a party. So, I was excited to read through Best Party Book ever! Help is a wonderful thing with parties, and this book offered quite of bit of insight and fun ideas. What caught my attention right off the bat was the fun food ideas for each party and how they fit into the themes perfectly...and the themes were all original and fun! Everything was bright, plus there are just pages upon pages of wonderful photos to help show you. 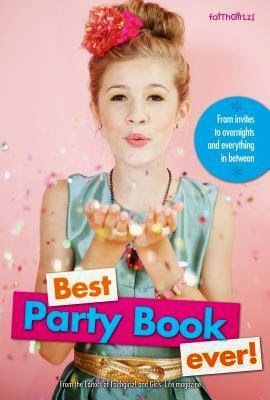 Perfect for the soon to be pre-teen to teens girl (I would gladly borrow some ideas for my next bash). It was also wonderful to see how things for the parties were divided up and made it easy for moms and daughters to work together...or allowed for the girls to plan their party on their own, with a little help from the parentals. This book also made sure to offer support and to remind everyone about that the party is for fun and time to spend with friends. This book is a wonderful guide and helper. It is one I will be hanging onto for future references as my littles gets older.